Sometimes it's not about winning or finishing, but just starting. If you have encountered me at all in the past month – either online or in real life – you know that I did a Half-Ironman Triathlon in September. Why would you know that? Because I have told absolutely every living person who has crossed my path. Friends, relatives, friends of relatives, the gal at the dry cleaners, the guy who bags my groceries at the store, I have covered everyone. Now, I don’t brag, mind you. I work it into conversation casually. For example, when asked at the grocery store if I want plastic or paper, I will say something like “Well, I just did a Half-Ironman Triathlon, so I am feeling pretty strong, let’s go with paper because it weighs more.” Or I might say “Paper or plastic? When I did my Half-Ironman Triathlon a few weeks ago, it was raining and I used plastic bags to keep my stuff dry, so let’s go with plastic.” See, I just finesse the conversation until I casually let the Half-Ironman reference drop. I am quite good at it by now. So, why do I mention it to every living creature within vocal range? Because I never thought I could do it, that’s why. Granted, I was surprised when I did my first marathon, but I had always been a runner, so once I started training, I was fairly confident I could pull it off. A triathlon, however, was so far outside my realm of experience that I had no such confidence. I thought it equally likely that I might drown, crash, or otherwise not finish and/or die. I am still amazed at the massive psychosis that took over my mind and spurred me to sign up for it in the first place (you can read more about my journey to the Half-Ironman here). It was something that I thought was absolutely impossible, and yet I did it with the support and encouragement of my family, my friends and my fantastic coach Nina. Every time I wanted to give up, they were there for me, telling me I could do it, even when I doubted myself. And it worked. The feeling of having done something I thought impossible is still overwhelming. However, after my triathlon was over (did I mention it was a Half-Ironman?) 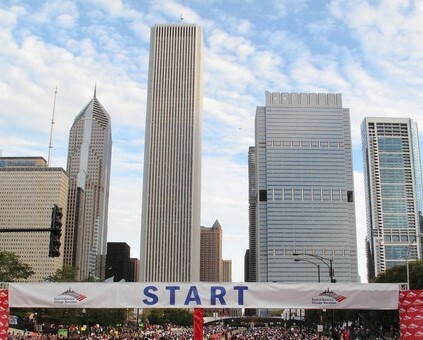 I realized I had another race on the calendar: the Chicago Marathon on 10.10.10. Huh, I’d almost forgotten about that one. 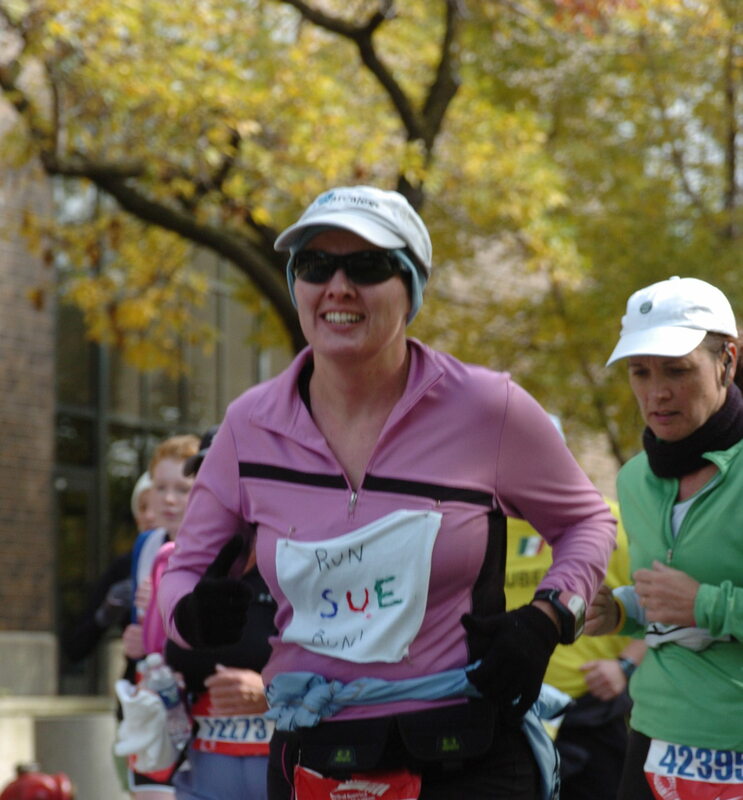 Although I’d had a great experience at last year’s Chicago Marathon, I had not planned on doing it again. All those long runs were enough to drive me crazy. I am a slow runner, so 20-mile training runs take me the better part of a day, and I can’t stand to be alone with myself for that long. But, then I saw the date – 10.10.10! Impulsively, I signed up. 10.10.10 sounded fun! I conveniently forgot that although the date was “fun,” it was still a marathon. Still a 26.2 mile race. Still a summer filled with grueling training runs. What in the world was fun about that? As my marathon training wore on, I almost dropped out. After all, I had done my “A” race, the triathlon (did I mention it was a Half-Ironman? ), and doing the marathon seemed like nothing more than a lot of work. My motivation sagged. I began to think that perhaps I needed to run the marathon for a larger cause, something beyond just personal satisfaction, because it wasn’t feeling very satisfying anymore. I will admit that I have mixed feelings about fundraising runs. On one hand, I believe strongly that if someone is going through all the effort of doing a marathon (or another major athletic event) to raise money for an organization, the least I can do is support that person with a monetary donation. And all the organizations I have been asked to support have been worthy of every penny. On the other hand, I have resisted doing a fundraising run myself because I am reluctant to ask friends to foot the bill for my athletic events. Would I like to run a marathon in Hawaii and have it paid for in return for soliciting donations? Sure! Who wouldn’t? But I also feel if I really want to run a marathon in Hawaii, I should just pay to go myself, and if I want to support an organization, I should write my own check. Yes, there have been times when I have gotten shut out of a race and I have run as a charity runner just to get the bib, so I make my own contribution to pay for it and leave it at that. But this was different. I did not need a bib number – I already had one. I did not need an organization to provide me with accommodations or travel arrangements. I just wanted to put all that training and effort and – yes, let’s just use the word – pain towards something good. As I was wrestling with the issue, my friend Margaret invited me to come learn about a non-profit called Back on my Feet, which was launching its new Chicago chapter. I found out that one of my runner friends, Chanthana, was going to be at the same event, so I figured sure, why not? I’ll go check it out, hang out with Margaret and Chanthana and have a good time. As I sat at the event and learned more about the organization, I realized I had found my cause. Back on My Feet was started by a spunky woman named Anne Mahlum, a runner who lived in an “up and coming” (read: historically undesirable) neighborhood in Philly. Her morning runs took her by a homeless shelter where she developed a bit of a rapport with the guys hanging on the street corner out front. One morning, a crazy idea popped into her head: she was going to start a running club for the guys at the shelter. Now, you might ask, as I did, don’t the homeless need clothing, job training, and opportunities instead of a little exercise? Well, yes, but stop to think for a minute about what running gives you in your life. Yes, it is a way to stay fit, maybe to shed a few pounds, but to be a consistent runner requires dedication, motivation, structure, optimism and perseverance. In return, running gives us confidence, self-discipline, self-satisfaction, self-sufficiency, determination and a sense of accomplishment. Some days it quite simply gives us our sanity. It gets us through rough patches. It is a constant. Now imagine if you were homeless, adrift, feeling like a failure, hopeless. Imagine someone told you that you could run a mile but you didn’t believe it was possible. Then imagine yourself doing it. Imagine how that would feel. You might start to believe that if you can run a mile – something that felt impossible – maybe you can do anything. That one mile might change your life. That is what Back on My Feet is all about. It brings a sense of accomplishment and pride to people who probably thought they could never feel that way again. It can change their lives; it may even save their lives. And it all started with one woman and a crazy idea. Crazy like running a marathon is crazy. 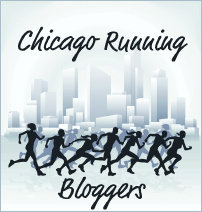 So I am proud to say that I am running Chicago Marathon (on 10.10.10!) as a fundraiser for Back on My Feet. And since I already have my bib, etc., every penny of every donation goes straight to helping their programs. I hope you can contribute and help someone else get back on their feet. Because sometimes it is not about winning, and it is not even about finishing; sometimes it is all about starting. If you’d like to donate, click here to go to my fundraising page. In the meantime, did I tell you I did a Half-Ironman? Click here to see an NBC nightly news video about Anne Mahlum and Back on My Feet. As usual – a great post!! I have mixed feelings about being a charity runner, too. Maybe one year, I’ll get into it. BOMF (glad you figured out what the acronym meant!) seems like a great org for you to represent. When we’re out there this Sunday, we can think of how running can positively affect others. Sue – You inspire me at daybreak on Mondays! I can’t wait to read your race recap! It was a tough day to race in, but it was on 10-10-10! Years from now you’ll know exactly what you did on 10-10-10! I am certain I will remember what I did on 10.10.10, even if I try hard to forget!